While the adventure in working on this project began months ago, I’ve finally sorted through the mess of files I made and put it all together in a nice handy zip folder. Using Arduinos, XBees, LCDs, and PHP, this project was challenging from a technical stand-point, but I think the project is now at a place where it can act as a foundation for a number of other projects I’m hoping to take on. 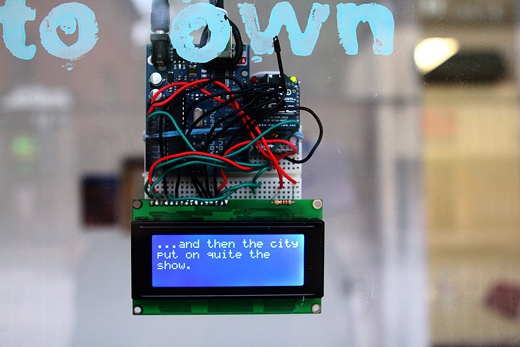 While the most-recent installation of this project was on view as part of SRSI, I’m already looking at the Arduino-TVOut library dreaming of what to do next. Certainly, it’s no surprise that I really, really like working with text. I think there’s something about text that allows an accessibility to the work that isn’t always possible with an exclusively image-based presentation. So, while I had some loftier ambitious at the start of this project, it was actually the process of running into those walls that helped me to move this project into something that is more flexible and expansive (in the long-run). 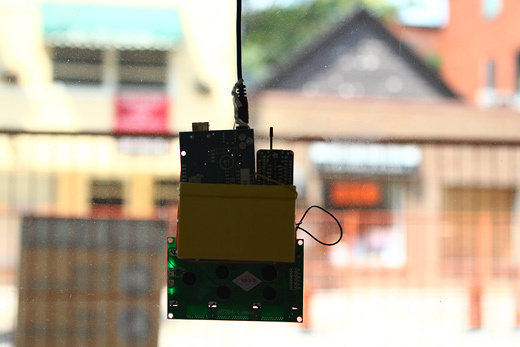 I think there’s a lot of strong potential for this project — it’s possible for these to be battery-operated (though in my tests, you won’t get a hugely long run out of them), and even if you are tethered to a wall-based power source, you can still install these in a variety of situations. 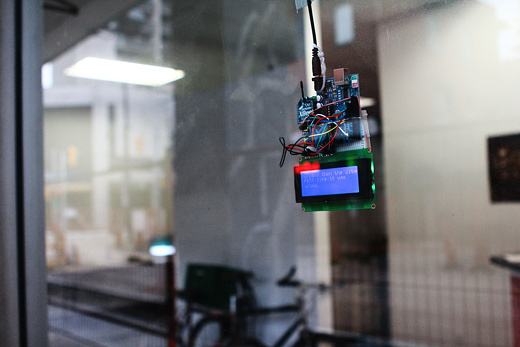 Being able to dynamically insert messages into public space is very fun and as this project continues to develop, it could provide the groundwork for a lot of new tactical activities. 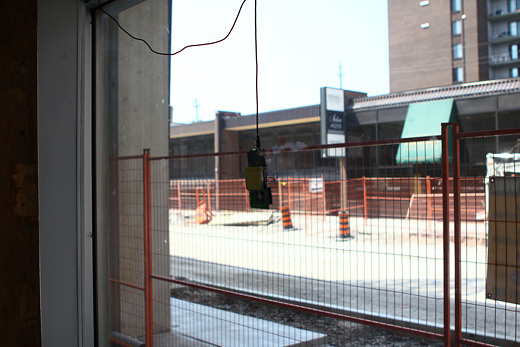 As for the installation in the storefronts on Pelissier, I hung the LCDs from their power cable. 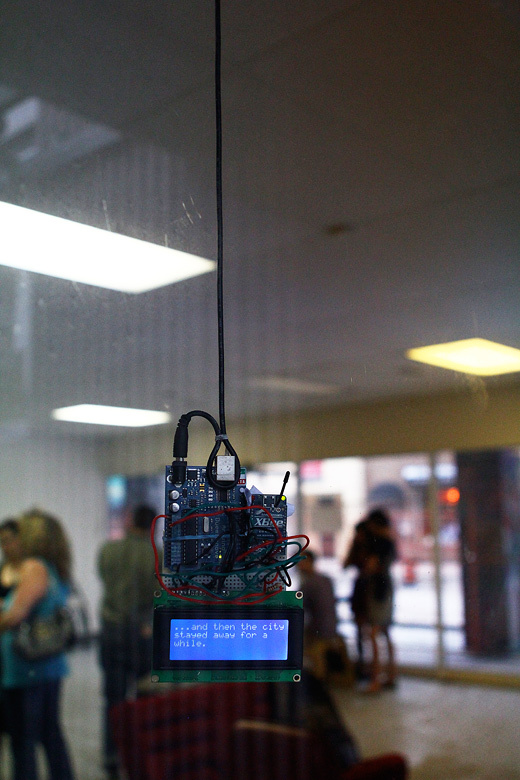 Behind a desk was the MacBook and XBee sending out the text-data wirelessly to these LCDs. It’s a bit crude, but elastic bands and a small bread board was all that I needed to keep this together. You can see the power cable doubled as a hanging mechanism. Given the size of the screens, I think it helps a bit to have all of the cables and hardware visible to help it stand out a bit more. Perhaps having hundreds of screens together could help (something similar to Listening Post by Mark Hansen and Ben Rubin? ), but the resources required for that are beyond me at this time. 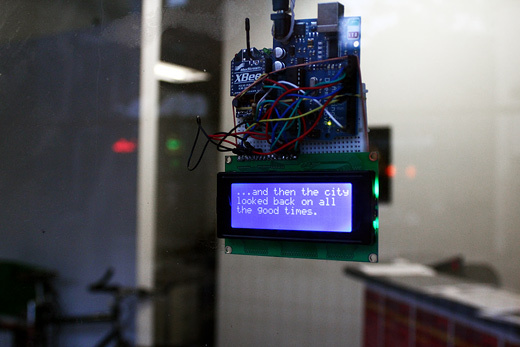 For the installation at SRSI, the screens displayed a series of “…and then the city” texts, pulled from a simple text file. The screens were more visible behind some glass than others, but the physical distance between them actually made it so that you would see a different text by the time you reached each one as you walked between them. The software can also grab an RSS feed and display that, although it gets a bit iffy if the character length is greater than something around Twitter’s 140 characters. Mostly this is due to my likely poor logic skills when writing the PHP code that would wrap the words appropriately. Behind the glass, somewhat annotated by (or perhaps annotating) some of Thea’s project. Perhaps most important technical thing to note in terms of the PHP is that the LCDs will not wrap lines in the middle of words. However, when getting RSS feeds, it won’t display URIs at all, as they may be fairly useless on a screen like this. This particular installation ran without any problem for 3 or 4 days straight, so it’s very stable. It seems that the LCDs that were stationed around the 100′ mark were a bit finicky, not always receiving the text. It would have been nice to setup a type of mesh network between the XBees, but trying to configure them on OS X proved essentially impossible. Here are some important notes when considering a project like this (that is, using PHP for a serial interface, working with XBees on OS X, and trying to wrap lengthy texts on an HD44780-based LCD. 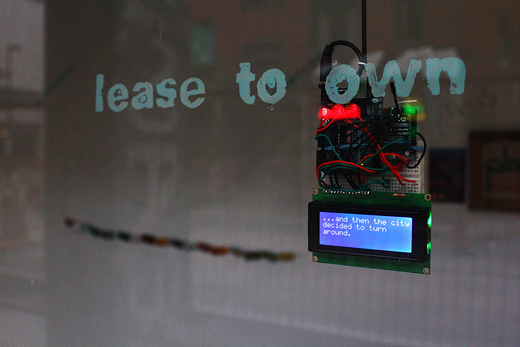 The 4-line LCD wants to wrap text as follows: Line 1 to Line 3, Line 2 to Line 4. There are a number of LCD libraries for Arduino out there, and one may have very well already figured this out, but if not and if you happen to use the basic LiquidCrystal.h library with a 4-line LCD, then you’ll have to do something similar to what I did in my Arduino script. Using case breaks in the Arduino code, I basically manually guided the LCD to write in the correct order: Line 1 to Line 2 to Line 3 to Line 4. It used a character that the PHP script would insert to make those line breaks. PHP would measure a line and attempt to wrap text appropriately, without breaking up the words. Configuring XBees on OS X is an exercise in frustration. It’s been done, but I didn’t have any luck using any of the tools, tips, or tricks. It may be my aging MacBook Pro, or the fact that I’ve done a System Migration from an even older MacBook, but for whatever reason, I could not configure the XBees. Thankfully, by default, the XBees would work and talk to one another, but only in the basic send/receive setting. On the Arduino, you have to disable the auto-reset by basically routing from the 5V power to the RESET pin on the Arduino with the 120 OHM resistor in between. That is, you have to do this on each Arduino+XBee+LCD setup you have, so that they can continually be open to receiving Serial data. And, if you’re really having difficulty in making something like this work, you may want to check how you’re addressing the Serial port in the PHP file — you may have seen examples as /dev/tty.usbserial-xxxxxxxx, but you might actually want /dev/cu.usbserial-xxxxxxxx. So, overall, I think that all of this research has actually become a useable foundation for other upcoming project ideas. I’m glad that it’s flexible in that it can read from RSS feeds and text-files, and with that, it could easily be updated to read emails, web-pages, etc. The one element that has continued to elude me is the integration with SMS, although using something like FrontlineSMS may be the answer, though inevitably, the incoming part of any of these SMS systems is the expensive and confusing part. Great post Justin. This is a heap of resources that would all be useful. That tvOut extension appears to be an area of great potential. 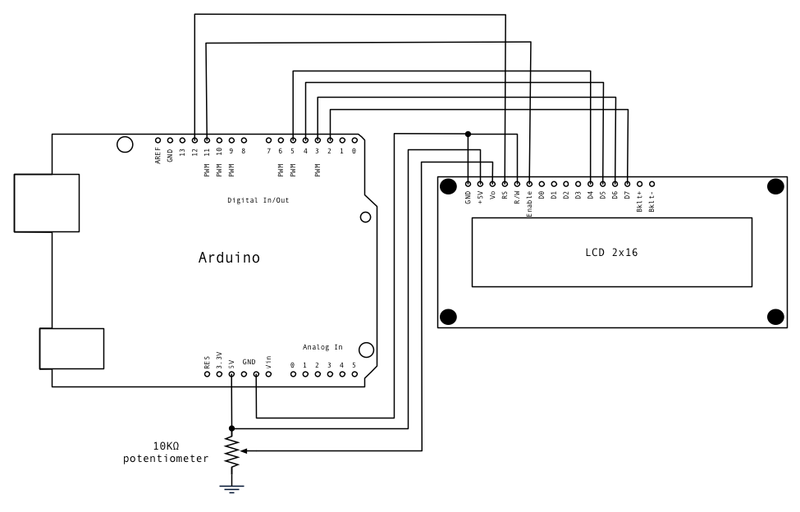 Im going to be delving a lot into arduino technology in the upcoming semester so you wont be alone. Im also going to explore the textile side with the lilypad arduino and the potential for interactive clothes or materials. 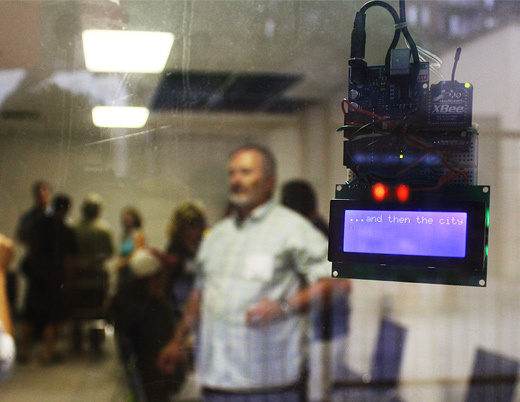 Glad to hear you’ll be continuing your adventures with Arduino, and that Lilypad stuff has a ton of potential. Keep me posted, we should play. Thanks Stephen, I shall have a try, But I am still puzzled on how it is accomplished?